There will be a GA at 7 PM at the Farmers Market in Ocean Beach on Newport Ave. at Cable Street this Wednesday, thereafter OSD-CP GA is now two days a week, Wednesdays at 7 PM at ChildrensPark and Saturdays at 7 PM at RedwoodCircle in Balboa Park. Dr Lisabeth Ryder (Liz) is visiting San Diego until Friday the 18th of the month; she is encouraging people to turn away from the existing capitalist structure to embrace co-ops which have no connections with the 1%. Visit http://occupyjobs.org/ for her contact info. Also to learn more about cooperatives see the event listing for May 16th. Jason: "This one of the posters I've painted for the chicago summit. 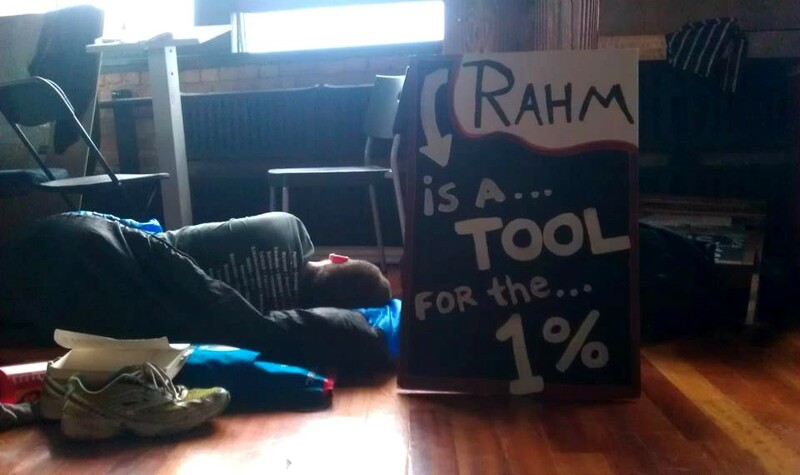 Rahm is the mayor here. No one I've met likes him. You can shout "fire the mayor" anywhere in the city and people honk their horns in solidarity." Occupy Walkers USA are in Chicago to protest the NATO summit. A video of them being harassed by CPD They were told it was illegal to record a police officer. Our brother Andrew Fisher (Fish) received a 90-day sentence and very onerous stipulations for his three year probation period upon release. If you have a professional relationship with Fish, i.e. medical professional, minister, etc., you can register to visit him even if he is allowed only two thirty minute social visits/week. We need to coordinate our visits to him through a Facebook "event" page, if you are not on FB, please contact Carlos at carloshsoh@hotmail.com so he can work it in! To email Fish and for more info go to the Sheriff's page for Fish. Once you have been scheduled to see him (via Carlos), you'll need to register here before the visit. Occupy Walkers were at a two day People's Summit and planning meeting for next week's NATO protests. There are two OSD groups. A larger group has two General Assembly (GA) meetings at 7 PM Wednesdays at ChildrensPark (except for May 16th, when it will be in Ocean Beach at the Farmers market instead), and at 2 PM on Saturdays at or near Redwood Circle in Balboa Park. Another group meets weekly at 2 PM Saturdays, at Civic Center Plaza. (4p) Media Committee meeting after GA at RedwoodCircle, Balboa Park. 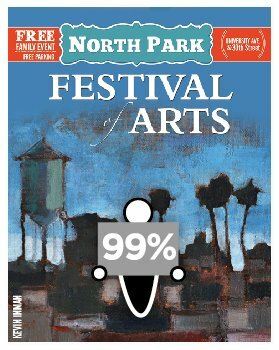 (12p) OYC Occupies the North Park Festival of the Arts near 3064 University Avenue to make sure the artistic community of North Park are aware of what's going on in this country and how we are working to make sure that this country is a free and fair space for art, dance, music, poetry, and photography! (2p-8p) "Day of the Drum - Music is a Weapon" at the WorldBeatCenter. (6:30p) A new documentary describing evidence of a controlled demolition of the three World Trade Center Towers from Architects and Engineers for 9/11 Truth, will screen at the JoyceBeersCenter, introduced live by Richard Gage, AIA. Free admission - donations welcomed. (7p) The PeaceResourceCenter will have a talk by and discussion with former Department of Energy project consultant and former plowshares prisoner Peter Lumsdaine, on nonviolent resistance to the corporate One Per Cent's military enforcement Matrix, before it is too late: from the NATO Summit to California's hidden nerve center for global drone war. This is in preparation for a challenge this summer California's little-understood strategic command center for global military operations, robotic killing machines and nuclear escalation. http://www.copswiki.org/Occupy/OccupySanDiegoEmailBlast2012May15 <== click here to see the rest of the report.